What does the term "busted hand" mean in poker? 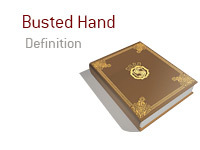 What is the definition of the term "busted hand" in poker? In poker, a "busted hand" occurs when a player misses their straight or flush draw. For instance - let's say that you are in a hand. You are holding 8d-9d, and the board reads 2d-3d-Kc. You have a diamond draw. You play the hand aggressively, betting out after both the flop and turn. Unfortunately for you, the turn and river brings the Kh and Qh, which means that you have missed your flush. At this point in the hand, you have a "busted hand". You have a busted draw, as you didn't hit a diamond on the turn or river. Now you have a decision to make - will you bluff on the river, hoping that your opponent also had a draw (straight or diamond draw) or maybe a small pair, or will you check and give up on the hand?